Are you dreaming of grabbing your rucksack, hitting the road and never looking back? Just imagine what it would be like to visit some of the world’s most historic monuments while you’re on the road travelling from one exotic place to another. Exciting isn’t the word for it. True or not? You don’t even need to be into history or archaeology to want to stand in front of the temple ruins in Tikal or celebrate the summer solstice at Stonehenge. Doing it doesn’t have to be just a dream either. Everyone deserves an adventure at least once in their lifetime, so what are you waiting for? While you’re packing and printing your boarding pass, make sure you put at least a few of these wonderful historic monuments on your list of must sees. You’ll regret it if you don’t. You might think Stonehenge is just a circle of giant, moss-covered stones in the middle of a grass field, well, you wouldn’t be wrong. But what’s special about Stonehenge is the mystery which surrounds it. No-one knows where it came from or how it got there. Is it a ceremonial site or a big sundial? No-one’s sure. It even has scientists and archaeologists baffled. Why Go? 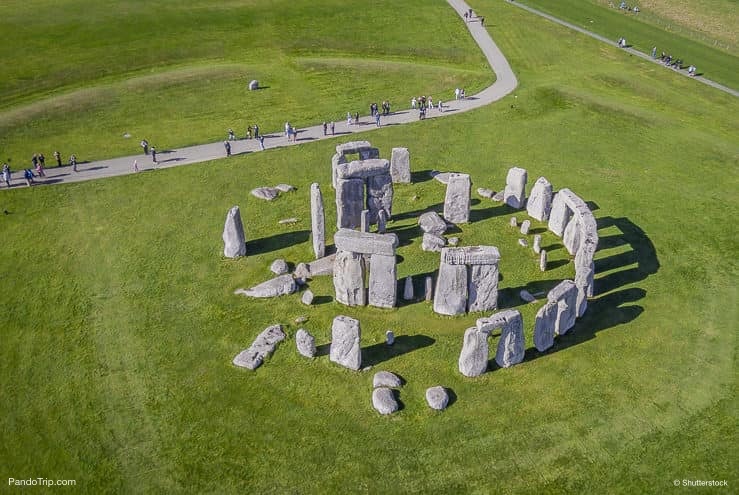 You don’t need to be a hippy or a follower of pagan religion to feel Stonehenge’s unique, magnetic power when you stand between the stones. 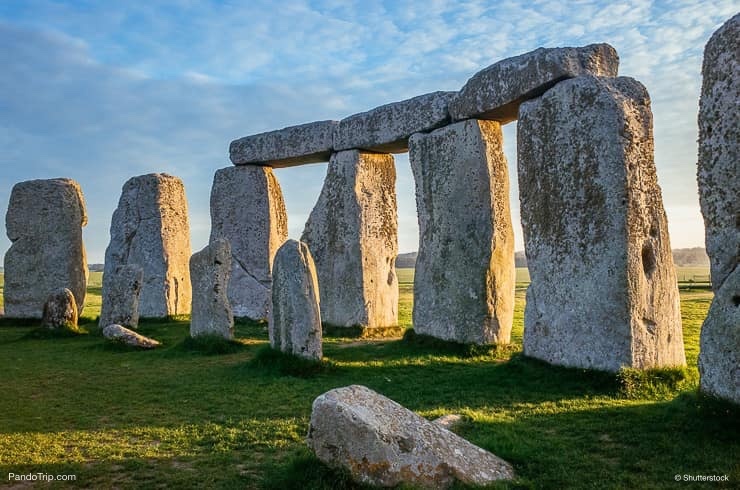 To be there at summer solstice is to experience what it might have been like for Neolithic man to watch the sunrise over Salisbury Plain on the longest day of the year. That’s not something you can do every day. Skip The Queues. To avoid the crowds and have a more select, individual experience at Stonehenge,then take a tour of the inner stones after closing time. Numbers are strictly limited so make sure you book well in advance of the dates you plan to visit. Best Time To Go. Stonehenge is in England so there’s never going to be guaranteed perfect weather. Late Spring through Summer and possibly as late as early Autumn are the best times to visit Stonehenge. Yes, it’s cold up there in wintertime, but the stones look fantastic with a coating of snow or frost. Have you dreamt of exploring ancient and deserted archaeological sites in the hope of discovering some lost artefact from a past civilisation just like Indiana Jones? If you have then you need to go to Tikal in Guatemala. The abandoned Mayan city is more than a ghost town on a grand scale where the jungle is encroaching on the ruins, it’s a real anthropological conundrum. Where did all the people go? And why? Why Go? You probably won’t be able to solve the mystery of a disappearing civilisation with just one visit, but you will get a chance to understand what it might be like to be alone in a post-apocalyptic city. Just think, Will Smith and I am Legend, with temple ruins instead of skyscrapers and thankfully, no zombies. There’s not many places in the world you can have an experience like that so go for it. Skip the Queues. To get the full force of that post-apocalyptic feeling, you’ll need to be up early. Book on the first tour of the day, which starts at 6am and you’ll be there to watch the sunrise above the jungle canopy and cast its light on the ruins of the abandoned city. Avoid the weekends if you can as Tikal receives many local visitors then. Best Time To Go. Guatemala has a rainy season which, unless you really liked to get soaked to the skin, it’s best to avoid. Plan for the dry season between November and the end of April, but as Tikal is at quite an altitude, be prepared for the the normally moderate temperature to drop in the evenings. Are you thinking seen one Buddhist temple and you’ve seen them all? If you are then think again. The Borobudur Temple Compounds in Indonesia, apart from being the largest Buddhist temple in the world, is completely unique structurally. Just its silhouette against the skyline is something to be marvelled at. It’s monumental. Why Go? The Borobudur Temple Compound has more domes and platforms than any other Buddhist temple plus over five hundred different Buddha statues. That’s a lot of stone work by anyone’s standards. So if you’re going to see any Buddhist temple, make sure it’s the biggest and best one. Skip The Queues. The Borobudur Temple Compounds are a very popular place to visit. To avoid the crowds who flock there, go early. The Compounds open at 6am, but only visitors booked on a sunrise tour can enter the complex before 8am so make sure you get a ticket. Best Time To Go. Although Indonesia does have a wet season, from November through to March, it doesn’t usually rain until later in the day. It’s also the quieter time of year as far as the visiting masses are concerned. April through to October, although the weather is drier, is the busiest time for tourists. When the ancient Greeks constructed the Parthenon, they made sure they chose a spot from where every inhabitant of Athens could see it. Even today the modern sprawl of the city hasn’t encroached on its hillside position. It really is an outstanding example of a past civilisation’s dedication to their deity in all senses of the word. Why Go? There are many archaeological wonders which just haven’t survived all the toils and troubles man and Mother Nature have thrown at them through the centuries. The Parthenon, which is well over two thousand years old, isn’t one of them. Yes, it’s got a few cracks, some of the columns have fallen down and the roof, if there ever was one, has long since caved in. Which is understandable when you consider its age. Will it be there for another thousand years? Who knows. So it’s best to go and see this stunning monument while it’s still standing. Skip The Queues. There’s really only one way to avoid the crowds that flock to view the Parthenon on a daily basis and that’s to book a private sunset tour. Wander through the ruins and then watch the sun go down. It’s an ethereal experience. When To Go. Summer temperatures in Athens can reach forty-degrees Celsius and more plus the city suffers from a serious smog problem when it’s so hot, so skip the months of June through to September and go in the winter or spring. Does the myth of the Ark of the Covenant fascinate you? Legend has it that the mystical box of magical powers is buried under the structure known as Temple Mount in Jerusalem. Well, there and a few other places too. Is it? Who knows, and it’s only one of the religious controversies which surround Temple Mount. Why Go? It’s the perfect place to ponder on the origins of man and their connection with religion. Is this really the place where God spoke to Abraham or where Muhammad went up to heaven and returned to earth with his teachings? One can only surmise, but when you’re there, you might just start wondering, is there any explicable reason why the Dome of the Rock looks almost like a giant, golden-domed flying saucer which has come down from space and landed right on Temple Mount? Curious. Skip The Queues. Entrance hours to get in to view Temple Mount are very limited. It’s only open from Monday to Thursday for three hours in the morning and one in the afternoon. Be there one hour or more before opening time and you might just beat the queues. Best Time To Go. Jerusalem has pretty moderate temperatures all year round. Yes, it does get a bit warmer from May to October, but it’s still a bearable average of 25 Celsius. To avoid getting wet, skip the months of December through to March when there’s a possibility of rain. Modern advances in construction and technology often make us complacent about how ancient structures actually came to be. 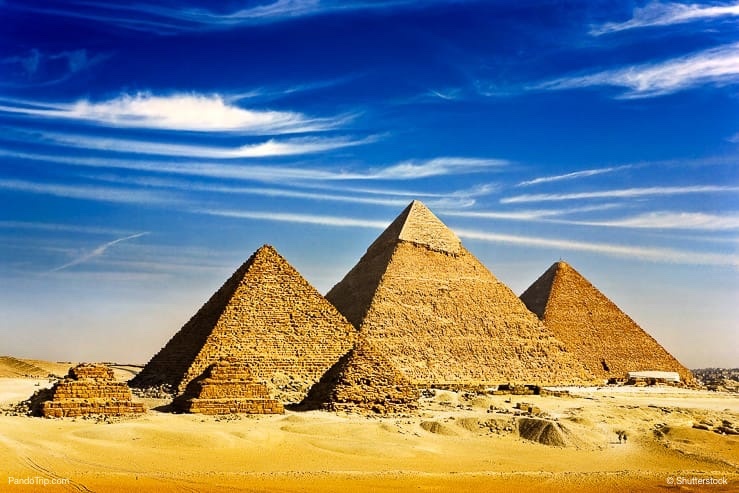 The Pyramids of Giza are one of the original seven wonders of the world and even though they’ve been there for almost five thousand years, no-one can manage to agree on how they were actually built. Why Go? The magnitude of the Pyramids of Giza can’t be appreciated unless you’re actually there. Photographs just don’t do them justice. When you see them first hand, you’ll really begin to appreciate how difficult a task it must have been to build them with no machinery. Even though the pyramids have been part of the Egyptian landscape for what seems like forever, you never know when they just might get swallowed up by the swirling sands of a desert storm and never be seen again. Skip The Queues. To miss the host of tourist bus tours that visit the Pyramids of Giza the best time to go is late afternoon when they’ve departed for other destinations. Stay on to watch the sun set over the desert, but make sure you’ve got a camel booked for your ride back home. Best Time To Go. June to September are the hottest months in Egypt and temperatures soar far too high for comfortable sightseeing. Go any time from October through to April and you’ll save a fortune on sunscreen. Many ancient civilisations have left their mark on the land they colonized. Chichen Itza in Mexico is one place where the Mayans left theirs. Though, don’t worry, you won’t see any heads rolling down the steps of the temples of Chichen Itza, unlike in the Mel Gibson film, Apocalypto, which celebrated the races legendary ferocity for human sacrifice. Why Go? The Chichen Itza is a good reminder that it’s not only animals that can be an endangered species. The Mayans are just one of several ancient civilisations which now no longer exist. Although the ruins of the city and temples remain, the people who inhabited it are no more. It’s a sobering thought to consider, as you’re exploring Chichen Itza, that humans can face extinction too. Skip The Queues. 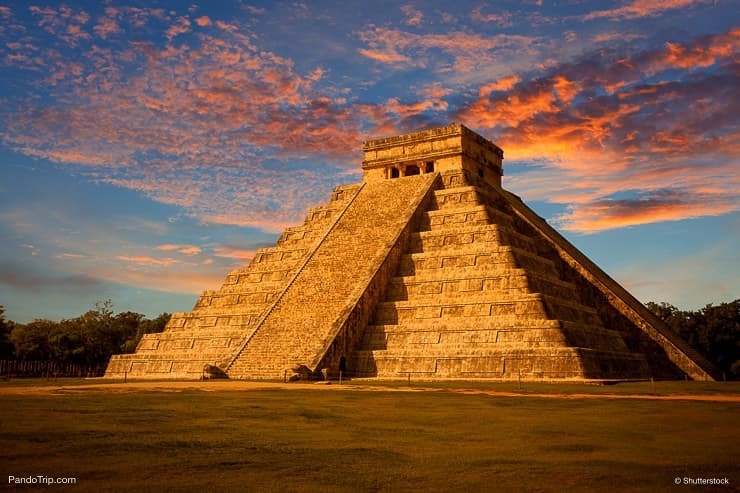 You won’t notice any imminent human extinction looming when you see the size of the queues at Chichen Itza, so get there either early morning before the crowds or late afternoon after they gone. Best Time To Go. Try to avoid September and October, they’re the worst months for getting drenched by rain and humidity. November through to April is the dry season, but can get pretty crowded so it’s probably better to focus your trip for around May or June, but whatever you do, don’t lose your head over it. Are you someone who likes to get ahead? If you are then you really should go to the Easter Island where the Moai Statues are, they’ve got more than enough heads for everyone. Although to be fair, the Moai Statues aren’t just heads, they have strange stubby torsos too. Why Go? There are some pretty strange things in the world and the Moai Statues definitely rate as one of them. Their features are in some ways quite horrific and it’s quite possible to surmise they were originally carved and placed in position to scare off invaders. Time takes its toll on most features, even a statue’s. As the Moai Statues are carved from volcanic rock, the elements will eventually wear them away, so go and visit them soon, before they become a faceless wonder. Skip The Queues. If you’re lucky enough to get to Easter Island to see the Moai Statues, don’t worry you won’t need to fight off the crowds. It’s isolated location in the middle of the South Pacific Ocean, off the coast of Chile, means there’s not a great influx of visitors. Best Time To Go. For bearable weather plan for the months of July and August when it’s not to hot. January and February are the hottest months and so are best avoided as is May as it tends to rain quite a lot. It doesn’t matter where you go in the world, you’ll find at least some evidence the Romans were there before you. They built everywhere. Not surprisingly, they even did it in their home town of Rome and the Colosseum is perfect evidence of their construction skills. Why Go? Given the times when it was actually constructed, and even though it took them about ten years to finish it, it was a colossal feat of engineering. The intricacy of which can’t be fully appreciated until you’ve been down below ground and seen it for yourself. Yes, there really is more to the Colosseum than initially meets the eye. But unless you go and actually have a look then you will never know. Skip The Queues. The Colosseum is the most visited historical monument in Italy. To be able to enjoy exploring it with being shoulder to shoulder with half of Europe, take a private Underground Colosseum Night Tour. You won’t exactly be alone, but you waste half a day queueing either. Best Time To Go. To avoid the suffocating heat of an Italian summer in the city, visit the Colosseum in Spring, Autumn or Winter. If you have an aversion to rain, yes, it does rain in Rome, then skip Winter and go in either of the other two seasons. Some things were built for the sole purpose of keeping out the marauding masses. The Great Wall of China was one of them, but sad to say in this modern age, it’s had the adverse effect. Yes, you guessed it. It’s now one of China’s biggest tourist attractions and people flock to see it in hoards. Why go? The Great Wall of China is one of the few man made structures which can be seen from space. If the orbiting astronauts have had a look at it, then why shouldn’t you. Okay, you won’t be able to see all of it, it winds its way through the Chinese countryside for thousands of kilometres, but you can get a look at a little bit of it if you go somewhere like Beijing. Skip The Queues. Choose to visit a section of the wall which is a longer drive away from Beijing than the rest like the section at Simatai. You can ride up in the cable car or wait until nightfall. The Simatai is the only section of the Great Wall open at night and places are limited for the illuminated hike, so pre-book or check availability before you go. Best Time To Go. Spring or Summer are really the only times to visit the Great Wall of China. Go in Autumn or Winter and you could end up frozen. It’s pretty chilly up there. If you’ve ever wanted to journey to an enchanted land then Angkor Wat in Cambodia would be the place to go to fulfil your dream. It looks like something straight out of a fairy tale as well as being the biggest religious monument in the world. Why go? While Angkor Wat in Cambodia isn’t exactly a fairy tale castle it does have it’s own moat and is steeped in more legends than the imaginary Camelot. When you wander through it and see some of the temple buildings consumed by the roots of giant trees, it just might inspire you to write your own version of the enchanted forest. Skip The Queues. Be up with larks or even better, well before and be at the complex gates for when the open at 5am. An alternative is to wait until late afternoon 4pm by which time everyone else is hot, bothered and going home. Best Time To Go. November through to March are the cooler months in Cambodia and that’s a fact lots of visitors take advantage of. June to October is quieter on the people front, but is a lot hotter and can also be wet. Do you think there’s something cool about living in a cave? If you do, then you need to check out the most sophisticated ones on the planet. 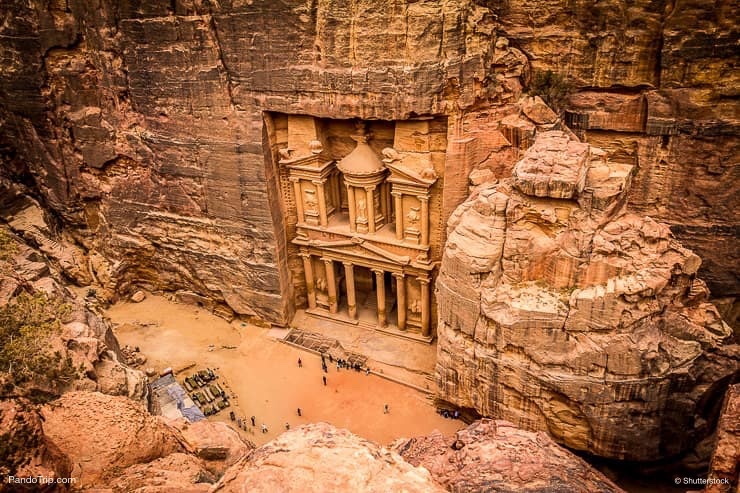 Petra in Jordan is a whole cave city carved from solid rock which dates back to antiquity and further. Why go? There really is nothing to compare with Petra anywhere else in the world. It really is monumental and on the grandest scale imaginable. Towering facades have been intricately hewn into the pink stone and inside there’s temples, monasteries and tombs. But what nature gives can also be taken away and soft stone has a bad habit of turning to dust over time, so make sure you visit Petra before it becomes just another pile of historical rubble. Skip The Queues. The best way to skip the queues to get into Petra is to be at the gates for when they open at 8am. You’ll be well inside and ahead of the crowds who arrive later in the morning on the tour buses. Best Time To Go. Petra suffers with searing heat during the summer months. To be able to wander round comfortably go in the cooler months of March to May or September through to November. 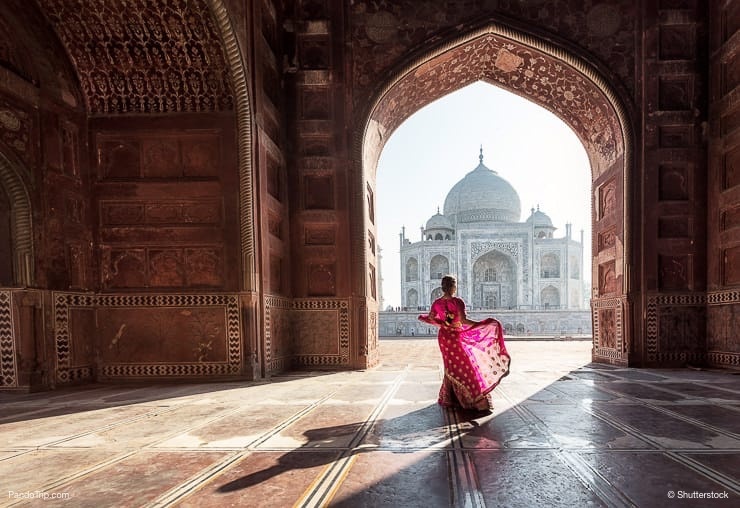 There are quite probably very few buildings in the world which are as instantly recognizable, by almost everyone, as the Taj Mahal in India is. What’s even more surprising is that it’s still as white and shiny now as the day it was built almost four-hundred years ago. Why go? 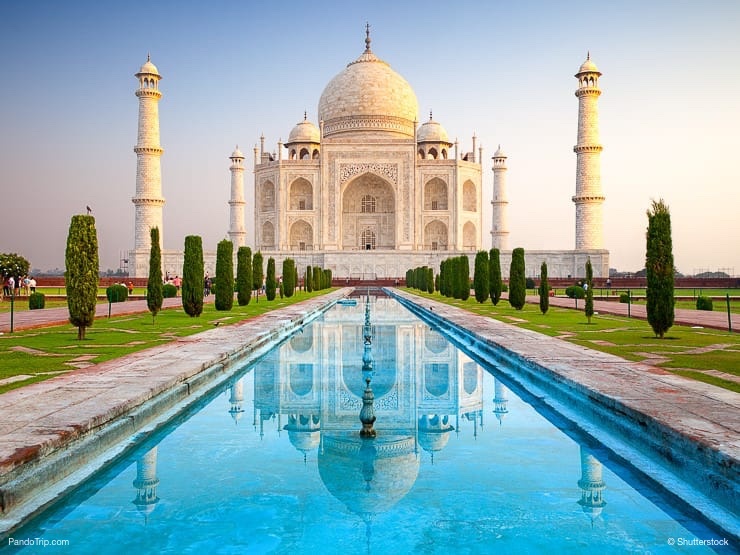 If you’ve got a romantic soul then you shouldn’t miss visiting the Taj Mahal. It’s the only historic monument that was truly built out of love and not out of a love for marble either. The iconic structure was commissioned by a Mughal emperor in memory of his wife. Does love get any grander than that? Skip The Queues. The Taj Mahal gates open promptly at 8am, if you’re there a couple of hours before you won’t skip the queue, but you may well be at the front of it. Best Time To Go. To make the most of the coolest temperatures think of visiting the Taj Mahal from October through to March though be prepared for some foggy mornings. There’s only one place to go if you want to be on top of the world and that’s to Machu Picchu in Peru. It might take you a while to get there as it’s about two-and-a-half thousand feet above sea level, but who said there was any rush? Time, at the top of mountains at least, seems to stand still. Why go? If you manage to get to Machu Picchu, well pat yourself on the back, as even the Spanish invaders never found it and they were pretty hot on conquesting everything. If you make it up through the jungle and up the mountains, congratulations, you won’t exactly be on cloud nine, but well above it. Skip The Queues. Think of having an all-nighter and you may have found the solution to the queues at Machu Picchu. You won’t be queueing to get in, but rather for the bus to take you up. The first one leaves around 5.30am, think of being there three or four hours before and you might just get a seat. Don’t forget to buy your ticket the day before or you’ll have got up for nothing. Best Time To Go. Machu Picchu, because of its geographical location, has a wet and dry season. April to October are the months which constitute the dry season with the premium months for visiting being June through to September.